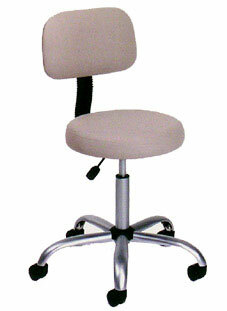 High Back Drafting Stools Chair. Ergonomically designed emulates the natural shape of the spine to increase comfort and productivity. Upholstered in durable beige vinyl for easy maintenance and cleaning. Adjustable seat height with a 6″ vertical height range. Dual wheel casters allow for easy movement. Attractive chrome finish on the base and gas lift. Overall Size: 24″W x 24″D x 34.5-41″H.